Buying Kitchen & Bath Sinks. Buying Kitchen & Bath Sinks. Kitchen sinks come in a variety of sizes, shapes, and materials. As a central fixture in the most active rooms of the house, kitchen and bathroom sinks see plenty of action. 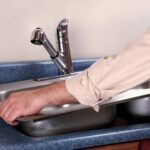 Day in and day out, the kitchen sink is the focal point of food preparation and cleanup while the bathroom sink is the focal point for personal preparation and cleanup. 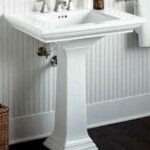 Accordingly, both kitchen and bath sinks are made to be both durable and attractive. A sampling of kitchen sink basins. When it comes to buying a new sink, the options can be overwhelming. In fact, you’ll quickly learn that sink designers have been very busy in recent years. Modern sinks come in a variety of materials, mounting methods, bowl shapes and sizes, finishes, and more. Just go to the Kitchen Sinks Buying Guide and the Bathroom Sinks & Lavs Buying Guide to explore your options.